"Took The Quill Along" when the Olympia High School Marching Band was chosen to represent Illinois in the Independence Day Parade in Washington DC on July 4th. The two friends enjoyed several days of touring Washington DC before marching down Constitution Avenue on July 4th before a very large crowd and then watched fireworks from the Washington Mall along with about 450,000 other people! They toured many of Washington's historical sights that also included Arlington National Cemetery and Mt. Vernon. A good time was had by all that went and it is something they will always remember. 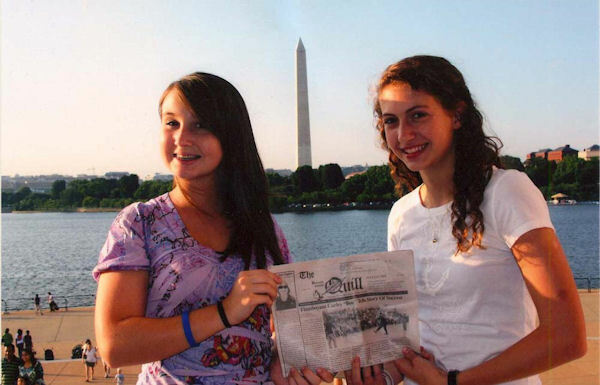 When you go on a trip, take "The Quill" along and have your pictured taken with it, then send it to us. Let's see where all "The Quill" can travel.